Profolio features a full-view pocket on the front cover and a reversible spine insert label for fully customized presentations and reports. PVC-free, dust-repelling polypropylene construction means documents will not fade or stick to the sheets. Profolio is ideal for storing photocopied, and laser/inkjet printed documents. 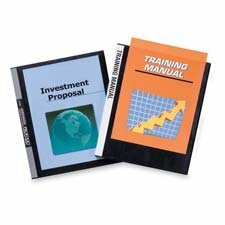 Presentation tool also includes clear, nonstick, letter-size pockets. Itoya Art Profolio Art Envelopes: 20" x 26"